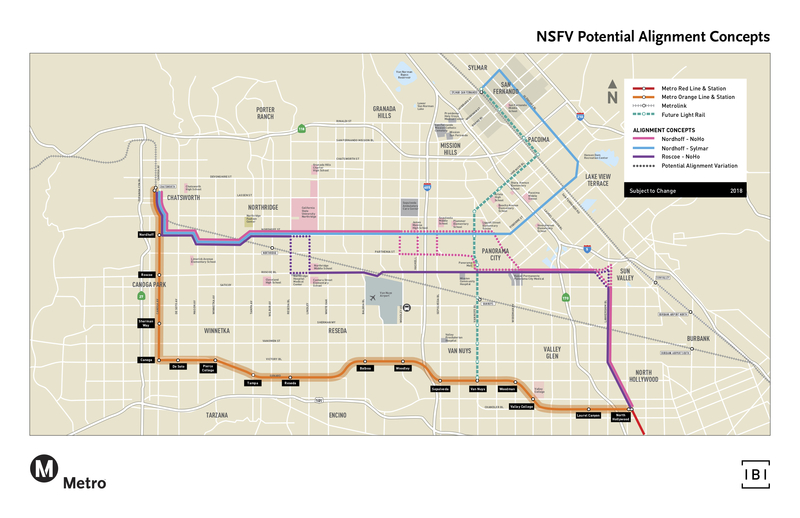 A key Measure M project in the San Fernando Valley is a new bus rapid transit line that would run across the northern part of the Valley. Public meetings for the project are scheduled later this month — dates and times are below. The North San Fernando Valley Bus Rapid Transit project’s home page is here. •The project seeks to create an 18- to 20-mile long route that would serve key destinations such as CSUN and Kaiser Permanente, enable people to spend less time traveling and connect with other transit lines, including the Chatsworth Metrolink/Amtrak station and Metro’s future light rail line between the Van Nuys Orange Line Station and the Sylmar/San Fernando Metrolink station. •Potential routes could connect Chatsworth to North Hollywood or Chatsworth to Sylmar/San Fernando. Nordhoff Street and Roscoe Boulevard are busy streets that could be used for parts of the route. See the above map. •What is bus rapid transit, also known as BRT? BRT is a high-quality bus service that provides faster and more reliable, equitable and convenient service. Features might include fewer stops, frequent service, bus lanes, high quality stations, transit signal priority, all-door boarding, off-bus fare payment, zero-emission vehicles and more prominent branding. •The project is scheduled to begin service by 2025 with $180 million in funding from the Measure M sales tax approved by L.A. County voters in 2016. •Metro is in the midst of an Alternatives Analysis (AA) for the project. The AA will narrow the list of potential projects to be further studied in a more detailed Draft Environmental Impact Report. Thursday, September 20, 6 – 8 p.m.
Wednesday, September 26, 6 – 8 p.m.
Thursday, September 27, 6 – 8 p.m.
All Metro meetings are held in ADA accessible facilities and are accessible by transit. Spanih translation provided. ADA accommodations and other translations are available by calling 323.466.3876 or California Relay Service at 711 at least 72 hours in advance. For questions or to share your feedback, call us at 213.418.3082 or via email at northsfvbrt@metro.net. *This meeting will include an overview of the North San Fernando Valley and NoHo to Pasadena BRT projects that may interface at the North Hollywood Station. For more information about the NoHo to Pasadena BRT project, please visit metro.net/brt. That map is a little inaccurate. Valley Presbyterian Hospital is on Vanowen near Sepulveda- definitely not on Parthenia between Sepulveda and Van Nuys. How about just having better service on the Ventura County Metrolink line? I think they tried but they encountered a setback with the double tracking in a small community. About a mile worth of I remember. They also can’t double track in the tunnels, which were built for a single track. Widening them would be prohibitively expensive, from what I’ve read. Metrolink’s reasoning whenI asked about weekend service on the VC line is its already served by the surfliner and the Valley residents killed their preposition to double track the valley. they need to pay for that and arent willing to. Its the county…. not metrolink. The county needs to either find funds to pay for it or they need to pass a transportation tax to pay for it.. two such proposals have been rejected by VC voters. its too bad. it would be great to have weekend service on the line. Look to Mexico City. The way they do BRT is excellent and would work well in L.A. Many of the stations are enclosed in the center of the road and are easy and comfortable to wait in. Buses are given their own dedicated lanes in the center of the road. If you go outside rush hour, the trip is really pleasant and easy. Is there a reason why there isn’t a freeway section to this (looking specifically at the Lankershim route)? If it’s gonna take more than an hour to get from NoHo to CSUN this line is already a bust, as there won’t be anything “rapid” about that. The only way it’s gonna take less than hour from NoHo to CSUN is if LA lets Metro really push for dedicated lanes and potentially higher-speed limits for BRT at the street level. Bypassing Lankershim via the 170 would deprive folks there of a convenient service. Metro could experiment with a bus that goes express from Roscoe or Osborne to North Hollywood Station. The 170 isn’t particularly as bad as the 5, the 101, or the 405. Our freeways are fairly underutilized by the bus system- largely because of car traffic. The bulk of it is political- an unwillingness to properly allocate lanes for 3+ HOVs- the 101 and 405 being the freeways that could really benefit from something like that. Than a “Rapid Express” version of this has to exist as well. I get the Metro Rapid Express (less 920 and more 940) failed, but I still believe they can actually work on actual BRT routes that have their “identity” (for lack of a better term). This is why I can’t help but to bash on Metro. They can experiment with some sort of express variant on the Orange Line and Silver Line yet EVERY bus has to make EVERY stop on those routes. While I get that the Orange Line may have limitations, I really hope Metro will be willing to Experiment with “Rapid Express” on Vermont, Colorado and Nordhoff BRT because the rapid routes are now becoming so ridiculously slow it’s a shame to call them rapid routes. Regarding freeway bus service, the Valley was served by freeway express bus service prior to the opening of the North Hollywood Red Line extension in 2000, many of those routes truncated at the Red Line station after its opening. The predecessor agency, SCRTD operated many of the same routes, many from drive-in theaters during its heyday. Some routes were taken over by LADOT for their Commuter Express service.